Holiday homes are all about the vibe and when you're heading away to the coast you want a bit of escapism. That's why Sarah Homes' Emily 2 Storey with garage and four bedrooms is an ideal fit. It's got a coastal feel with its skillion roofline and a huge deck to make it the best entertainer on the block. But one of the biggest pluses in this two storey, four-bedroom home is its affordable price, from $170,700 (slab footing included). And with easy dimensions of ll.4m x 14.8m, finding a suitable coastal block won't be difficult either. 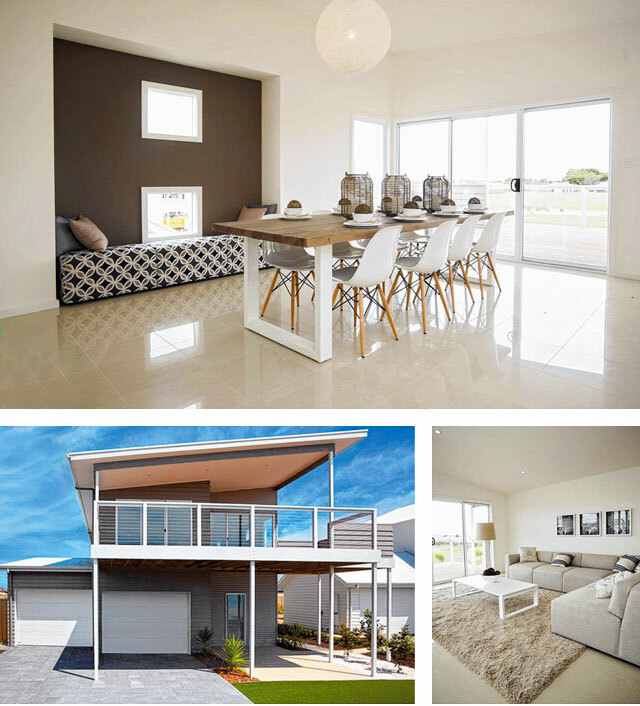 This contemporary design, which is on display at Aldinga Beach, showcases a mix of exterior cladding materials giving it the definitive Aussie beach feel, while the high pitched ceiling on the upper level makes the space feel more than generous. A wall of sliding doors to the front open up the space to potential views, while the sides are carefully kept discreet from neighbours with a series of narrow, long windows and port hole style feature windows for a point of difference. An open, bright living space on the upper level is zoned by key pieces of furniture, with the lounge to one side and the dining on the other, and the kitchen anchoring the area with its wide island bench with a breakfast bar overhang and double inset sinks. A walk-in pantry is a big plus to keep the kitchen clutter free, and beside it a powder room with separate toilet is an easy convenience for the family and guests. A built-in bench seat takes advantage of a recessed feature wall and provides yet another place to relax in or check your emails. The entire living space looks out to the large deck, which has been made private to one side, giving homeowners the advantage of an extended indoor-outdoor living zone. When separate living is required, head downstairs to the central lounge where a decent 4.8m x 5.6m space offers ample room to set up the TV and lounge, add a study or an indoor games area. Set off this downstairs living area are three of the four bedrooms, with access from the double garage as well as the home's entry. All bedrooms offer good proportions, but it's the master bedroom upstairs that is generous. The back of the upper level is taken up with the master suite where there's a double set of built -in wardrobes and a private ensuite with a l.8m wide shower. Other points you might like about this home are the storage area in the garage, next to the laundry; the three-way bathroom downstairs where multiple people can use it simultaneously; and the wide deck provides extra undercover parking for cars, something that will always appreciated in the hot summer months. There is also the option to swap the levels around and have the sleeping quarters upstairs and living downstairs.